Glaucoma is abnormal increase in the pressure inside the eye that leads to exposion of the optic nerve head to a high pressure and then the gradual death of optic nerve cells that results in complete blindness if not treated. -The most dangerous point here is that the disease progresses in an insidious way without making any complaints to the patient. And if the patient starts to feel its effects as blurring in vision, this means it’s too late. That’s why eye doctor should measure the eye pressure of all patients whatever the cause that the patient comes for, because most cases are actually diagnosed accidentally. -There is normal circulation of aquous humor inside the eye. It is secreted from ciliary body behind the iris, then is passes through the pupil toward the *anterior chamber in front of iris, to be absorbed in the irido-corneal angle by a special canal there called Schlemm’s canal. -In cases where some kind of obstruction is present in the exit route of aquous humor , the fluid will increase in amount and this increases the pressure inside the eye, which then applies a toxic effect over the optic nerve that starts getting damaged. If the case is not treated at this level by decreasing the eye pressure to the normal limits, damage to the cells of the optic nerve continue till the vision is lost completely. 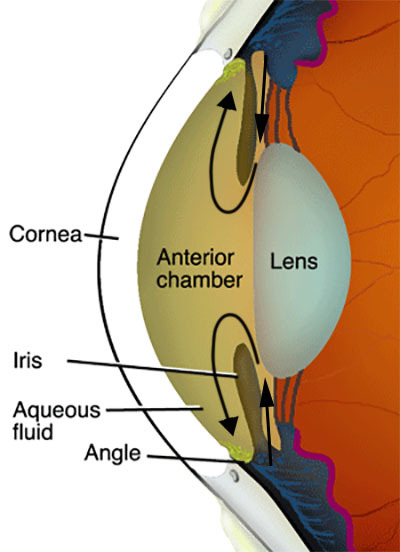 -The normal eye pressure is between 10-20 mm Hg. 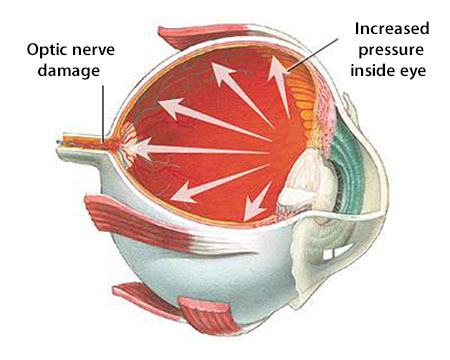 If it increases more than that , optic nerve cells start to be damaged because of the high pressure applied over it. *The first is the open angle galucoma, which makes 90 % of glaucoma cases . In this case the angle between iris and cornea is open, but there is some resistance against discharge of aquous humor outside, which causes increase in eye pressure. -The other kind is the angle closure glaucoma , where the irido-corneal structure of the eye. This will make the discharge of humor fluid more difficult outside the eye and hence, more accumulation of the fluid inside the eye that increases the eye pressure. In some cases glaucoma may be congenital , either because of genetic factors or due to some viral infections or drugs that had been used by mother during pregnancy. This congental glaucoma should be treated urgently by a surgical operation a.s.a.p. –Some kinds of glaucoma may be secondary to other diseases, like uveitis and iris inflammation, mature cataract, diabetes, retinal vein occlusion or steroid usage. -Whatever the cause of glaucoma, the main treatment is to decrease the eye pressure to the normal levels. This is usually performed by using some drops that decrease the eye pressure. In cases that drops are not enough to decrease the eye pressure to normal levels, laser application or surgical treatment may be very important to save vision. The aim of both laser and surgical treatment of glaucoma is to open some windows through which the eye fluid can get out from the eye ball, and eye pressure decrease to normal levels.